This is week 6 of a weekly art journal based on guides provided by Dale Anne Potter. All pages of this art journal are based on a tag created from card stock. This weeks challenge was When you’re on top of the world….. I started this week’s art journal tag by applying gesso and a wash of water colour. I chose oranges to reflect ‘joyfulness’ and used metallic mesh ribbon to provide a sparkle. The message is a combination of stick-on letters and squiggles paint. I once again used some of the brushwork for a playday with friends many years ago. 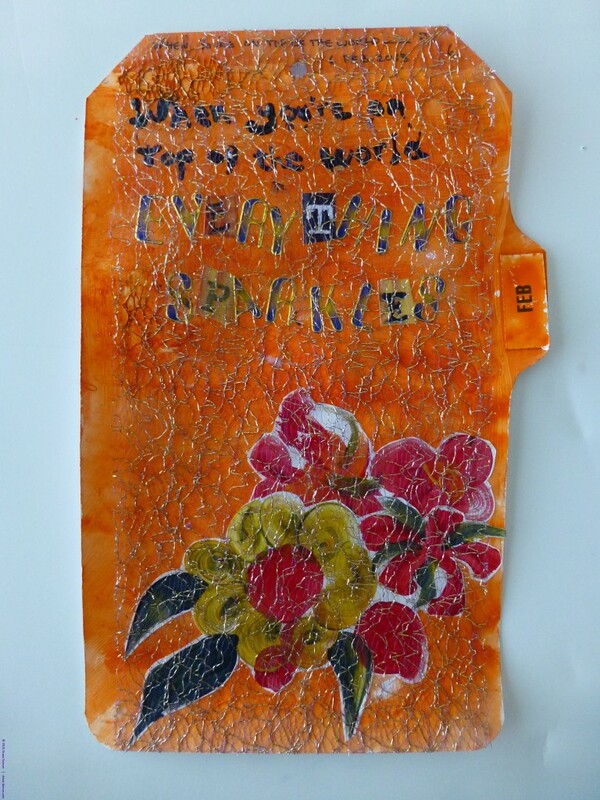 This week’s art journal topic ‘When you’re on top of the world…’ was a timely one for me. I completed the sentence with the phrase “…everything sparkles”. I am on top of the world right now. Life is good. It’s easy to describe how it feels. Not only am I reveling in the mellowness of the February sun but the slug work of setting up this website is progressing well and I love the site that is unfolding. It’s been great working with my son on this. I’m also make good project one of the major projects for this winter – an exhibition piece to be revealed later. An initial post about this project can be found in my blog.